Pereira, a senior in computer science, transferred to Missouri S&T from State Fair Community College in Sedalia, Mo., in fall 2013. 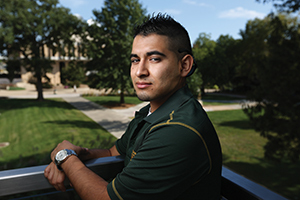 The first in his family to attend college, he wants to be an example of the opportunities Hispanic students have in the science, technology, engineering and math (STEM) fields. He helps organize ¡Sí Se Puede! (Yes, We Can! ), an annual weekend retreat for Hispanic and Latino high school students who want to learn more about pursuing a college education in a STEM field, ideally at S&T. Four high school students who attended ¡Sí Se Puede! last year enrolled at S&T in the fall 2014 semester. Pereira says student organizations and events like ¡Sí Se Puede! are essential in recruiting Hispanic students to STEM fields. “Within the Hispanic community, especially if your parents haven’t gone to school, you don’t know anything about college,” Pereira says. In January, Pereira returned to Honduras for a third time with Engineers Without Borders as the team’s translator. Pereira, who lived with his grandmother in Honduras until he was 12, says he remembers calling American volunteers in Honduras “gringos” when he was a child.